This article is about the traditional culture of Korea. For the modern culture, see Contemporary Culture of North Korea and Contemporary Culture of South Korea. The traditional culture of Korea has its mythical beginnings 5000 years ago. The legend of Dangun, the mythical founder of Korea, makes an impact upon Korean culture to this day. Add to that the profound impact of Shamanism, Buddhism, Daoism, Confucianism, and Christianity, and it yields the varied and colorful culture that is Korea. Although Korea today is divided North and South, the roots of their traditional culture remain the same. Their political ideologies are far less powerful than their cultural and historical common ground. North Korea and South Korea traditionally share the culture of Korea, although the political separation of the two nations has created two, distinct Korean cultures. Jeongak. Court music, Jeongak has a strong intellectual emphasis, closely related to the literate upper-class. 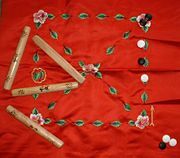 Played at an extremely slow pace, with single beats taking as long as three seconds, the beat of Jeongak matches the speed of breathing rather than the heartbeat as in most Western music, creating a contemplative and meditative mood. Jeongak's soft and tranquil tone arises from the non-metallic materials of the traditional instruments. String instruments have strings made of silk rather than wire, while bamboo have been the material of choice for almost all wind instruments. Minsogak. Korea's folk music, Minsogak expresses a wide variety of moods and emotions closely related to the lives of common people. Unlike Jeongak, the beat of Minsogak matches the heartbeat. As with the Jeongak, Minsogak commonly utilizes improvisation especially in the emotional music. Instruments. Traditional Korean wind instruments include the piri (cylindrical oboe), taepyeongso (metal-bell shawm), daegeum (transverse flute), danso (end-blown flute), saenghwang (mouth organ) and the hun (ocarina). Traditional string instruments include zithers such as the gayageum, geomungo, and ajaeng, and the haegeum, a two-stringed fiddle. Apart from the instruments used, improvisation and the lack of breaks between movements characterizes traditional Korean music. Pansori provides a good example of the latter. A pansori performance can last for over eight hours during which a single singer performs continuously. Rather than the contrasting of different speeds common in Western music, most traditional Korean music begins with the slowest movement and then accelerates as the performance continues. The cross-cultural exchanges with China and within the Three Kingdoms of Korea produced a large variety of distinctive dances. As with music, court dances and folk dances have distinct differences. Court dancers commonly perform jeongjaemu at banquets while ceremonial dancers perform ilmu at Confucian rituals. Native dances (hyangak jeongjae) and forms imported from China (dangak jeongjae) make up Jeongjaemu while civil dance (munmu) and military dance (mumu) comprise Ilmu. Shamanistic rites, handed down from one generation to the next, form the core of many folk games, especially the three rites, Yeonggo, Dongmaeng, and Mucheon. A drumming performance, Yeonggo invokes spirits while Dongmaeng blesses the harvest and Mucheon evokes the blessing of heaven. Koreans added games to those shamanistic performances during the Three Kingdoms of Korea. A number of folk games originated during the traditional twice monthly farmers' fairs including Ssireum a traditional form of wrestling, pitching arrows into a pot (tuho), and a game of stick-tossing (jeopo), swing riding (geunetagi), masked dance drama, and a ball game (gyeokku). A more maritial game, stone fights (seokjeon), caught the interest of the young men of the villages. In addition to farmers' fairs, Koreans played those games at religious, political, or royal celebrations. Petroglyphs of prehistoric times constitute the earliest paintings found on the Korean peninsula. 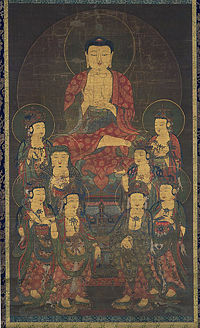 Buddhism from China introduced new techniques to art. Those techniques quickly established themselves as the mainstream techniques, but indigenous techniques still survived. Korean art expresses a tendency towards naturalism with subjects such as realistic landscapes, flowers and birds being particularly popular. Artists commonly use ink painted on mulberry paper or silk. The eighteenth century saw an advance in indigenous techniques, particularly in calligraphy and seal engraving. Korean craftsmen create a unique set of handicrafts produced in Korea, mostly for a particular everyday use, often giving priority to the practical use rather than aesthetics. Traditionally, the artisans used metal, wood, fabric, lacquerer and earthenware with glass, leather or paper used sporadically more recently. Ancient handicrafts, such as red and black pottery, share similarities with pottery of Chinese cultures along the Yellow River. The relics found by archaeologists from the Bronze Age have distinctive and elaborate features. Many sophisticated and elaborate handicrafts have been excavated, including gilt crowns, patterned pottery, pots or ornaments. During the Goryeo period, bronze artisans highly perfected their art. Brass, that is copper with one third zinc, had been a particularly popular material although Goryeo celadon ware has earned a reputation for beauty and style. Joseon craftsmen created popular handicrafts made of porcelain and decorated with blue painting. Woodcraft also advanced during that period, leading to more sophisticated pieces of furniture, including wardrobes, chests, tables or drawers. The use of earthenware on the Korean peninsula goes back to the Neolithic Age. Korean Ceramics has a long history included both Korean pottery, a later development after the traditional use of coils, and hammered clay to create early votive and sculptural artifacts. During the Three Kingdoms Period, Silla advanced the art of pottery making. Artisans fired the pottery using a deoxidizing flame, which caused the distinctive blue grey celadon colour. They embossed the surface with graceful geometrical patterns. In the Goryeo period jade green celadon ware became more popular. In the twelfth century, craftsmen invented sophisticated methods of inlaying, allowing more elaborate decorations in different colours. White porcelain became popular in the fifteenth century, soon overtaking celadon ware. The artists commonly painted or decorated white porcelain with copper. With the Japanese invasions of Korea in the 16th century, the Japanese kidnapped many leading potters to Japan where they profoundly influenced Japanese ceramics. Many leading Japanese pottery families today can trace their art and ancestry to these Korean potters. In the mid Joseon period (late seventeenth century) blue-and-white porcelain became popular. Potters painted designs in cobalt blue on white porcelain. With the growth of Japan's colonial hold on the peninsula at the beginning of the twentieth century, the tradition of porcelain largely declined in favour of Japanese imports. Koreans traditionally using geomancy to select residence sites, following the belief that topographical configuration generates invisible forces of good or ill (gi). The negative and positive energies (yin and yang) must be brought into balance. A house should be built against a hill and face south to receive as much sunlight as possible. Koreans still prefer this orientation in Korea today. Geomancy also influences the shape of the building, the direction it faces, and the building material. Traditional Korean houses have an inner wing (anchae) and an outer wing (sarangchae). The individual layout largely depends on the region and the wealth of the family. Whereas aristocrats used the outer wing for receptions, poorer people kept cattle in the sarangchae. The wealthier a family, the larger the house. The Korean government forbade any family except for the king to have a residence of more than 99 kan, kan being the distance between two pillars used in traditional houses. The inner wing normally consisted of a living room, a kitchen and a wooden-floored central hall. More rooms may be attached to this. Poorer farmers lacked an outer wing. Floor heating (ondol) has been used in Korea for centuries. Traditionally, Koreans used wood and clay to construct their buildings, so few have survived to the present day. More recently, wood, clay, tile, stone, and thatch have been used. Korean landscape architects use the same principles to create temple gardens and private gardens. They generally resemble gardens in China and Japan, all designed heavily influenced by Daoism. Daoism emphasizes nature and mystery, paying great attention to the details of the layout. In contrast to Japanese and Chinese gardens, traditional Korean gardens avoid artificialities. The lotus pond stands out as an important feature in the Korean garden. The architects build pavilions next to natural streams if possible, allowing the pleasure of watching the water. Terraced flower beds constitute another common feature in traditional Korean gardens. The Poseokjeong site near Gyeongju, built during the Silla period, highlights the importance of water in traditional Korean gardens. The garden of Poseokjeong features an abalone-shaped watercourse. During the last days of the Silla kingdom, the king's guest would sit along the watercourse during banquets, chatting while wine cups floated past them. 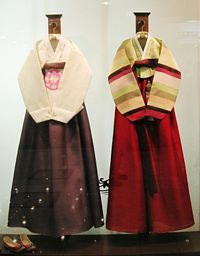 Hanbok from a shop window showing two styles. Notice the traditional shoes on the lower left side. The traditional dress known as hanbok (known as joseonot in the DPRK) has been worn since ancient times. The hanbok consists of a shirt (jeogori) and pants (baji). The traditional hat, called gwanmo, has special meaning is attached to this piece of clothing. According to social status, Koreans used to dress differently, making clothing an important mark of social rank. The ruling class and the royal family wore impressive, but sometimes cumbersome, costumes. They used jewelry to distance themselves from the ordinary people. Tradition often restricted common people to un-dyed plain clothes. That everyday dress underwent relatively few changes during the Joseon period. Everyone shared the basic everyday dress, although during official and ceremonial events, they wore clothes with distinctions: Everyday dress, ceremonial dress and special dress. Ceremonial dresses are worn on formal occasions, including a child's first birthday, a wedding or a funeral. Special dresses are made for purposes such as shamans, officials. During the winter people wore cotton-wadded dresses. People often used fur in making clothing. Ordinary people earned the name white-clad folk because they normally wore undyed white cotton clothing. Today, people still wear hanbok during formal occasions, although the everyday use of the dress has been lost except by Buddhist monks. Rice has been the staple food of Korea since before the Three Kingdom Period. As with all developing countries, Korea had been primarily an agricultural country until recently. Farming life has shaped the essential recipes in Korea. Rice, barley and beans, and many supplementary crops, have been the mainstay of the Korean diet. Seafood also has been important, since Korea enjoys oceans on three sides. Farmers developed fermented recipes early in Korea's history. Those include pickled fish and pickled vegetables, which provides essential proteins and vitamins during the winter. A number of menus have been developed. Those divide into ceremonial foods and ritual foods. Families use ceremonial foods when a child reaches 100 days, at the first birthday, at a wedding ceremony, and the sixtieth birthday while they use ritual foods at funerals, at ancestral rites, shaman's offerings and as temple food. Temple food constitutes a milder food, absent of the common five strong-flavored ingredients of Korean cuisine (garlic, spring onion, wild rocambole, leek, and ginger) and meat. Rice cakes serve as a essential food in ceremonies and rituals. The cook matches the colouring of the food and the ingredients of the recipes according to yin and yang, trying to reach a balance. Today, the whole population enjoys traditional court cuisine. Recently meat consumption has increased yet vegetable dishes still grace the family table. 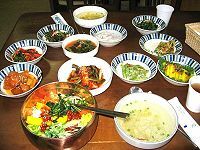 Traditional dishes include ssambap, bulgogi, sinseollo, kimchi, bibimbap, and gujeolpan. Tea in Korea dates back over 2000 years, used in worship recipes, hoping that the good scents would reach the heavenly gods. Buddhist introduced tea in Korea from China, giving rise later to the Korean Tea Ceremony. Originally used for ceremonial purposes or as part of traditional herbal medicine, Green tea is only one kind of tea drunk in Korea. Koreans enjoy numerous teas made of fruits, leaves, seeds or roots. Five tastes of tea—sweet, sour, salty, bitter, and pungent—distinguish Korean teas. Twenty-four turning points (jeolgi), each lasting about fifteen days, organize the Korean calendar. Although serving as the timetable for a disappearing agrarian society, holidays and special events still use the lunar calendar. 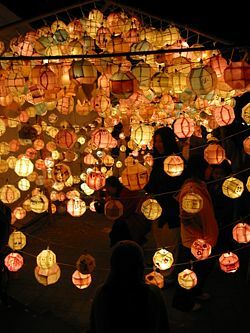 The biggest festival is the traditional lunar New Year's Day (seollal or gujeong). Other important festivals include the first full moon (jeongwol daeboreum), the spring festival (dano) and the harvest festival (chuseok). Older generations still celebrate their birthdays according to the lunar calendar. Seollal Lunar New Year's Day An ancestral service is offered before the grave of the ancestors, New Year's greetings are exchanged with family, relatives and neighbours; bows to elders (sebae), yutnori. See also Chinese New Year and East Asian age reckoning Day 1 of Month 1 sliced rice cake in soup (tteokguk), honey cakes (yakwa). There is also a number of regional festivals, celebrated according to the lunar calendar. See also Public holidays in North Korea and Public holidays in South Korea. Koreans enjoy playing board games, including Baduk, Jangji, and Yut. Baduk, known as Go in English, is particularly popular with middle-aged and elderly men. Baduk has a similar status as chess in Western cultures. Jangji, a Korean version of chess, developed based on an ancient version of Chinese chess. Yut, a popular family board game enjoyed throughout the country, played especially during holidays. Chajeon Nori, a traditional game involving two teams of villagers in a giant jousting match, occasionally entertains gatherings at holidays or special events. The only Korean Sauna in Europe opened at Bad Sodens Sodeniatherme (near Frankfurt/Main). One borrows the usual cotton-outfit for the up to 80 degree "Löß-Lehm"-wood cabines with a also ((hopefully)) healing stone floor (made out of Jade). Also Koreans from other European countries travel to this Sauna, to stay over night with their families (as in Korea usual: 24 hours opened). There are a number of designated UNESCO World Heritage Sites in Korea. UNESCO added the Jongmyo Shrine to the World Heritage Sites list in 1995. Built by Korean Confucianism to venerate the spirits of the ancestors of the royal family of the Joseon Dynasty, Jongmyo hosts an elaborate performance of ancient court music (with accompanying dance) known as Jongmyo jeryeak each year. Built in 1394, Jongmyo may have been one of the longest buildings in Asia, if not the longest, at that time. The shrine houses nineteen memorial tablets of kings and thirty of their queens placed in nineteen chambers. Hideyoshi's invading army burnt the shrine in 1592, but the government rebuilt it by 1608. Changdeokgung is also known as the palace of illustrious virtue. It was built in 1405, burnt to the ground during the Japanese invasion in 1592 and reconstructed in 1609. For more than 300 years Changdeokgung was the site of the royal seat. It is located in Seoul. The surroundings and the palace itself are well matched. Some of the trees behind the palace are now over 300 years old. Changdeokgung was added to the UNESCO World Heritage Sites list in 1997. The Silla court built Bulguksa, known as the temple of the Buddha Land and home of the Seokguram Grotto in 751. The temple compound consists of numerous temple halls as well as two pagodas. The Seokguram grotto serves as a hermitage of the Bulguksa temple. A granite sanctuary, a Buddha statue seats in the main chamber. UNESCO added the temple and the grotto to the World Heritage list in 1995. Haeinsa, a large temple in the South Gyeongsang province, built in 802 serves as the home to the Tripitaka Koreana wood blocks. The King of Goryeo ordered the carving of those wood blocks in 1236, the entire production completed in 1251. The wood blocks testify to the pious devotion of king and his people. The word Tripitaka is Sanskrit meaning "three baskets," referring to the coreBuddhist teachings. Consisting of 81,258 wood blocks, the Tripitaka Koreana constitutes the most complete collection of collection of Buddhist scripts. Amazingly, the monks carved the entire set without an error or omission on any of the wood blocks. The Tripitaka Koreana has earned the reputation as the most beautiful and accurate Buddhist canon carved in Chinese characters. UNESCO added the site to the World Heritage list in 1995. A fortress city built during in the late Joseon Dynasty, Hwaseong displays the features influenced by the Silhak movement during the late eighteenth century. Constructed in 1796, the fortress is located in Suwon south of Seoul in South Korea. The fortress covers both flat land and hilly terrain, something rarely seen in East Asia. The walls extend 5.52 kilometers with forty-one extant facilities positioned along the perimeter. Those include four cardinal gates, a floodgate, four secret gates and a beacon tower. UNESCO added Hwaseong to the World Heritage list in 1997. UNESCO added the sites of Gochang, Hwasun, and Ganghwa to the list of World Heritage in 2000. Those sites contain hundreds megaliths believed markers created out of large blocks of rock for burial sites in the first century B.C.E. Megaliths can be found around the globe, but nowhere in such a concentration as in the sites of Gochang, Hwasun, and Ganghwa. UNESCO added the historic area around Gyeongju to the list of World Heritage in 2000. Gyeongju served as the capital of the Silla kingdom. The tombs of the Silla rulers have been discovered and recovered in the center of the city. Those tombs took the shape of rock chambers buried in an earthen hill, sometimes likened with the pyramids. Hundreds of architectural remains from the Silla period scatter the area around Gyeongju, in particular on the Namsan mountain. Poseokjeong is one of the most famous of those sites. Gyeongju constitutes a virtual treasure store of Korean Buddhist art, sculptures, reliefs, pagodas and remains of temples and palaces from the seventh and tenth century. 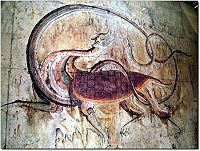 The Complex of Goguryeo Tombs lies in Pyongyang, Pyong'an South Province, and Nampo City, South Hwanghae Province, North Korea. In July 2004, it became the first UNESCO World Heritage site north of the 38th parallel. The site consists of 63 individual tombs from the later Goguryeo, one of the Three Kingdoms of Korea. It was founded around northern Korea and Manchuria around 32 B.C.E., and the capital was moved to Pyongyang in 427. This kingdom dominated the region between the fifth and seventh centuries C.E. ↑ Kim Hyun, Same roots, different style, Korea Is One. Retrieved July 24, 2007. ↑ Craig Simons, A Rare Glimpse into a closed world of Art, The New York Times, Retrieved July 24, 2007. ↑ On Mark Productions, Japanese Ceramics, Japanese Buddhist Statuary. Retrieved July 24, 2007. Breen, Michael. 1998. The Koreans: Who They Are, What They Want, Where Their Future Lies. London: Orion Business Books. ISBN 9780752813530. Clark, Donald N. 2000. Culture and Customs of Korea. Westport, Conn: Greenwood Press. ISBN 9780313304569. Koo, John H., and Andrew C. Nahm. 1997. An Introduction to Korean Culture. Elizabeth, NJ: Hollym. ISBN 9781565910867. Korean Cultural Center. 1999. Korean Culture. Los Angeles: Korean Cultural Center. OCLC 47139800. Osgood, Cornelius. 1951. The Koreans and Their Culture. New York: Ronald Press Co. OCLC 412547. Stickler, John, and Soma Han Stickler. 2003. Land of Morning Calm: Korean Culture Then and Now. Fremont, CA: Shen's Books. ISBN 9781885008220. Suh, Bernard Rowan, and Yoon-jung Cho. 2006. An Encyclopaedia of Korean Culture: English Edition. Seoul: Hansebon. ISBN 9788995135242. Life and Culture in Korea. PBS Online: Hidden Korea Culture. Royal Asiatic Society: Korea Branch. 1 Transcontinental country. 2 Only recognised by Turkey. 3 Not fully independent. 4 Also considered part of Europe for historical reasons. History of "Culture of Korea"
This page was last modified on 24 November 2017, at 20:28.